UPDATE!!! During the weekend of 12/12-12/13/09, David was given a room full of a sunshine and his own magnificent, vibrant aquarium. His mom reports that he is happier these days and loves his bedroom. The only problem now is that his school attendance has dropped because he doesn’t want to leave his oasis – can you blame him? I met David when he was approximately 9 years old. It was love at first sight! I was working part-time as a physical therapist in an elementary District 75 school for children with multiple handicaps in the Bronx. The children at the school were pre-schoolers all the way up to 9+ years old. They were all so adorable and fun to work with. But David and I shared a very special, mutual connection the moment we set eyes on each other. Although I was not his physical therapist, I spent some time with him everyday either inside his classroom feeding him or holding him upright in my arms while he tried to walk through the hallway. It became our thing…every time I would see David he would say, take me out of my wheelchair…I want to walk! David has cerebral palsy – spastic quadriplegia type. He is severely disabled and has very limited and purposeful voluntary movement of his trunk and extremities. David requires full support to sit upright and maximum support for all activities of daily living, including transitioning, eating, grooming and toileting. He has a manual wheelchair which he requires a caregiver to push; he does not have the ability to push himself. Unfortunately, he just does not have the ability to operate a motorized wheelchair with any part of his body. Whenever we explore the possibility, David becomes very down and frustrated when the initial attempts aren’t successful, and he never wants to go any further because he feels like a failure. I have come to know and love his mother and his entire family. In fact, his mother refers to me as his “Other Mom.” What a great honor and privilege to be given that title! David graduated from the elementary school and was transitioned to the District 75 High School I have been working in since 2001. His mother insisted that I be his physical therapist and I was thrilled. I have been his physical therapist ever since. Early on I did gait training (walking) with David utilizing different adaptive devices to help support his weight. He is growing so fast and my arms aren’t suitable anymore. Although he walked on tiptoes while in these devices, he enjoyed any chance at being upright and moving his legs to simulate walking. At this point, David’s hips are dislocated and he is unable to bear any weight on his legs, so we have had to discontinue upright, weight bearing activities. I know he misses this very much. David steals the heart of everyone he meets, especially the ladies. He has a smile that can melt your heart. But sometimes David drops his head down and a sad look washes over his face. It is so heartbreaking to witness this and it is very hard to coax him out of this state once he is there. At times, he cries in frustration. You see David is very aware of his disabilities and limitations. He has an energetic younger brother and lots of cousins running around him all of the time. He always asks his mom the question: “How come they can walk and I cannot?” As he grows into a young adolescent, he experiences more and more of these down times. This is very hard on his family, especially his mom. They want nothing more than to make David happy. David has been involved in the yoga classes I lead since he came to the school. He loves coming to yoga class, getting out of his wheelchair and being propped up on a beanbag chair or adaptive chair positioned on a yoga mat. He loves looking at the girls. You see David is quite the “Player” – he has 2 or 3 girlfriends at any given time. Because social relationships with children of varying abilities is encouraged in my yoga classes, David has come to have friends in the school that he would never have had the opportunity to meet otherwise. Very often when he is at his table in the cafeteria, many older, ambulatory students will stop by to chat with him and give him a hug. This makes his day! He chants OM the loudest of anybody in the yoga class and if his body cannot perform the yoga poses, his spirit is most certainly performing every activity we do in the class to the very fullest. He comes to school every Thursday (yoga day) with his sweat pants on and ready to participate. He told his mom when he first started attending classes that yoga makes him happy and that it is the only thing that takes his mind off not being able to walk. Those words not only brought tears to my eyes, but will always be my driving and motivating force to continue this work and open a Yoga Wonderland Center in the future, where children of ALL abilities can gather together and engage in positive body, mind and spirit practices (Yogawonderland.org). David’s favorite color is yellow. He said that he wants his bedroom to be yellow and filled with sunshine and water and fish. The Blissful Bedrooms volunteers aim to create a room for David where he can find solace, peace and understanding – his very own personal sanctuary. It is our hopes that with his new bedroom, David will experiences more moments of contentment and happiness, because a smile as illuminating as his should not be wasted. 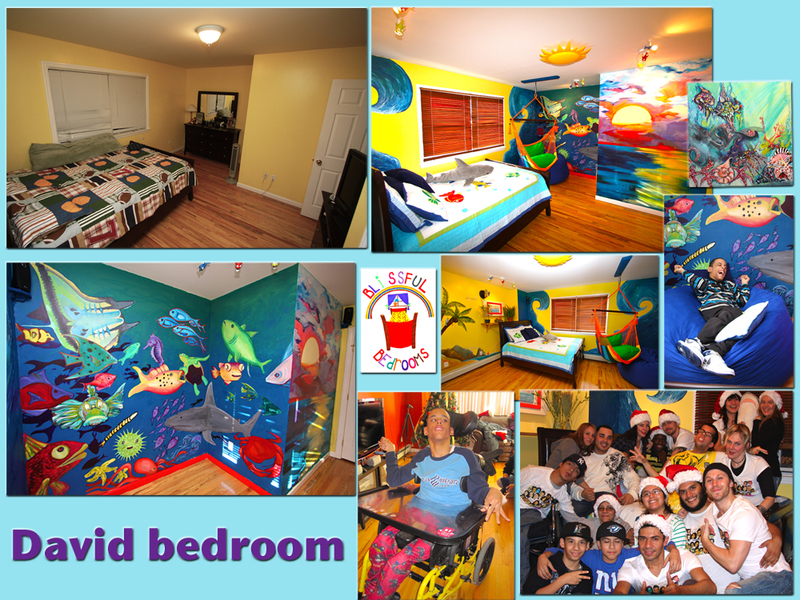 Thank you to all the generous people and organizations who have supported David's bedroom makeover!